This is one of many delizoso topping you could you use. It very simple to make and the pancetta together with a hint of chilli make this one of my favourites. In the words of Elizabeth Gilbert who wrote 'Eat, Love, Pray', "Im having a relationship with my pizza" and yes you will be too. Discover a new topping and let it take you to Italy, don't forget to add cheese, formaggio, formaggio. Theres never enough! Smear the tomato sauce (see basic pizza dough post) even.y over the pizza base! Tear the mozzarella into peices or finely slice it. scatter these over the base and a sprinkle of chilli flakes. Season with salt & pepper. 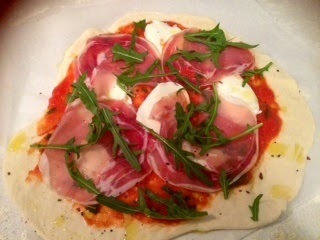 Lay the pancetta over the top so it crisps up during cooking and the juices will cook into the pizza. Drizzle with extra virgin olive oil. cook until crisp.